Warning: This article contains spoilers for the end of Bird Box. Eric Heisserer, the writer behind Arrival, tends towards the side of optimism. That's why the end of Netflix's new movie Bird Box, starring Sandra Bullock has an unequivocally happy ending -- despite the rampaging monsters who present horrifying visions and inevitable suicide to anyone who glances at them. It's a big change from the source material, a Josh Malerman novel. The movie, directed by Susanne Bier, jumps back and forth in time. In one thread, it documents the onset of a mysterious invasion by invisible creatures that menace the population. After witnessing the death of her sister (Sarah Paulson), the pregnant Malorie (Sandra Bullock) takes refuge in a home with other survivors. That storyline is intercut with shots of Malorie traveling down a treacherous river five years later with two young children, one of whom is her own and whom she refers to, simply, as Boy and Girl. In the text, Malorie arrives at her destination, a school for the blind, and encounters a community of people who have blinded themselves so they could never be victims again. The Netflix adaptation has a milder, sweeter ending. She also finds a school for the blind, but it's a joyful place, a haven filled with chirping birds that can warn of monsters' presence and children playing. There, she finally gives Boy and Girl names. "I think there are plenty of horror directors who are like, 'No, we've got to end on the idea that humanity is screwed and we're all doomed because that's life,'" says Heisserer. But he advocated for the change from the beginning, noting that the decision to end the movie in a different way than the novel came, in part, from the idea of who might be immune to the effects of this enemy before the apocalyptic event. "It seemed smarter for us to make that more of an optimistic ending. I'm one who generally leans toward a hopeful or optimistic ending even in dystopian horror movies. I'm not one to embrace nihilism considering that I feel like we're living in that world now." Though the supernatural villains remain non-corporeal throughout the entirety of the film, representing by gushes of wind, he and Malerman had discussions about their physicality. "For many drafts, the creatures did have a weight and a certain shape or form," he says. "But what they looked like we never really went into detail. We did need to know some other information about it so we could figure out, 'Well, can it enter into a house or another building? How much does it weigh? What does it bump into?' That was helpful for a lot of the set pieces." But where did this threat originate? Malerman provided no answers to this point even after Heisserer inquired. "Of course that was the first question out of my mouth when I finally got him on the phone," Heisserer says. "I adore him and he's a great guy and is full of crazy crazy ideas. His answer to me was, 'Oh, I have no idea, Eric.' I was like, 'Well damn, Josh, I'm in a tight spot now but okay.'" Heisserer did do his own research about connected mythology, which ended up in dialogue spoken by Lil Rel Howery's character, a budding novelist. The screenwriter eventually came up with his own concept, even if the film's producers weren't fans. "I did like the idea that these were entities from either another part of the galaxy or another dimension, some creatures that are not from here," he explains. "And their means of communication are entirely visual and they are looking for something that can understand them, but the problem is it breaks our brains" That is, he admits, not dissimilar to the mission of the Heptapod aliens in 2016's Arrival, which Heisserer adapted from a short story. 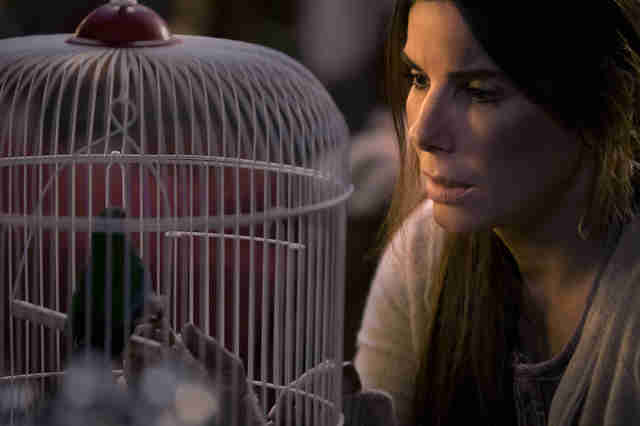 But in the final product, despite Malorie and the kids' making it to the sanctuary, Bird Box offers no sense that the death-inducing beings are somehow benevolent. It's all terror, however unseen.